The inhalation of crystalline silica, produces the well-known pathological reaction called silicosis. Many industrial sectors use in their processes quartz and/or quartz-containing raw materials. Consequently, the occupational environments of these companies may contain appreciable quantities of this pollutant. However, quartz cannot be replaced in most cases. Numerous studies suggest that the toxicity of quartz is conditioned by the surface chemistry of the quartz particles and, in particular, by the density and abundance of silanol groups. The effectiveness of the addition of substances like nano-alumina, aluminium lactate, and organosilanes to block these groups has been studied in the SILICOAT project, showing that the toxicity of the RCS contained in the wet-processed raw materials of the traditional ceramic industries can be virtually nullified. This effect was obtained by adding an additive to the ceramic compositions, which coats the quartz surface so that it becomes no longer toxic. This technology was found to be technically and economically feasible for traditional ceramics. 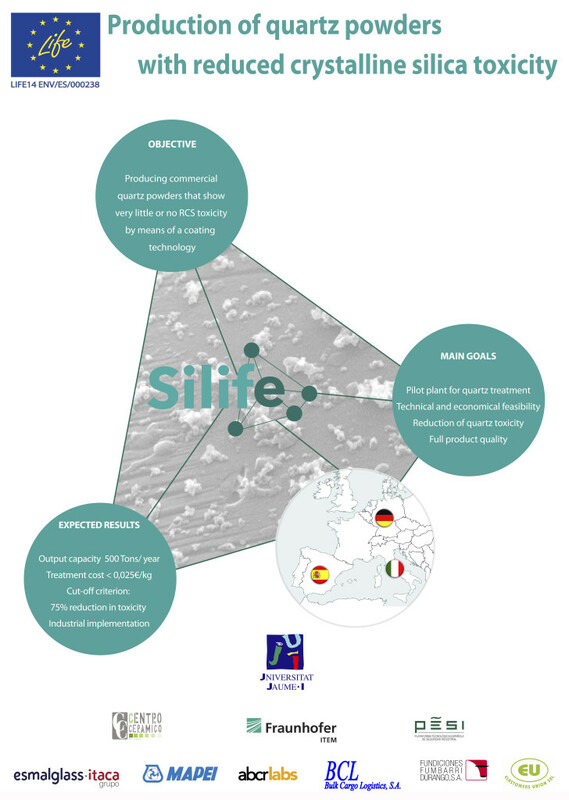 From these results, a new LIFE project (SILIFE) has been approved by EU and started in order to extrapolate these good results to other industrial sectors which use quartz in their dry processes. The main objective of this new project consists of producing commercial quartz powders that show very little or no RCS toxicity. To do this, a pilot plant for treatment of commercial quartz powders will be designed. The treated quartz produced in this plant will be verified by means of industrial trials performed by several end users from different industrial sectors.